World Expo has always been one of the most noteworthy international exhibitions of all time. Ever since its inception, nations exhibiting embody elements of all the three eras - industrialization, cultural exchange and nation branding to demonstrate new inventions. Italian architectural firm, Nemesi & Partners, has revealed its plan to clad the Palazzo Italia in Milan with a smog-filtering cement façade. 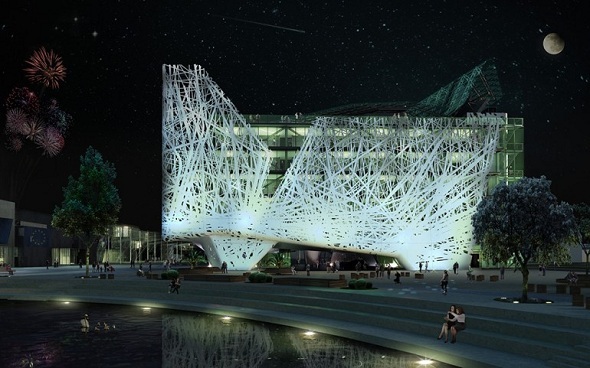 For the coming World Expo 2015 in Milan, Italian architectural firm, Nemesi & Partners, has revealed its award winning plans to grace the Palazzo Italia in Milan with a smog-filtering cement façade. Inspired by nature, and the 2015 Milan Expo theme "Feeding the Planet, Energy for Life", the final design put forward by the architects embraces the eminent concept of biomimicry. The distinctive pavilion will be made from special air-purifying cement which has been created by Italcementi. The pavilion will require an estimated 2,000 tonnes of cement to stretch over 9,000 square meters of the building. The final design, as shown as Nemesi & Partners bear a resemblance to stretched out tree branches that wrap themselves around the pavilion. Italcementi describes the workings of smog-filtering cement façade, “The entire outdoor surface and part of the interiors will consist of i.active Biodynamic cement panels”. The cement will be treated with active ingredients in air-purifying cement, TX Active. "In direct sunlight, the active principle contained in the material ‘captures’ certain pollutants present in the air and converts them into inert salts, helping to purify the atmosphere from smog." 80% of the air-purifying cement is made from recycled materials like scraps from Carrara marble. The Palazzo Italia will also be clad with a photovoltaic glass on the roof in order to generate solar energy. “The overall concept of the architectural design of the Italian Pavilion is that of an urban forest in which the building, through its skin and its volumetric arrangement, takes on the features of an architectural landscape," says Nemesi & Partners. "The branching pattern of the external cladding of Palazzo Italia coherently interprets the theme of the tree of life, inserting it in the form of a petrified forest." “With what we have termed urban photocatalysis,” explained Enrico Borgarello, Group Research & Development Manager for Italcementi, “in the presence of air and light a natural process of oxidization is created which leads to the decomposition of organic and inorganic substances present in the city. Let us take, for example, nitric oxides and dioxides, sulfur dioxides, carbon monoxide, i.e. some of the elements which we see controlled everyday by air monitoring stations: the photocatalytic reaction which occurs on the surface of the material treated with TX Active, thanks to its cement matrix transforms these pollutants into salts which have no impact on the environment and health. A central feature of Milan Expo 2015, Palazzo Italia is scheduled to stay as a permanent feature, according to city plans, even after the six-months long expo tails off.